Mom's Gone Bronson! 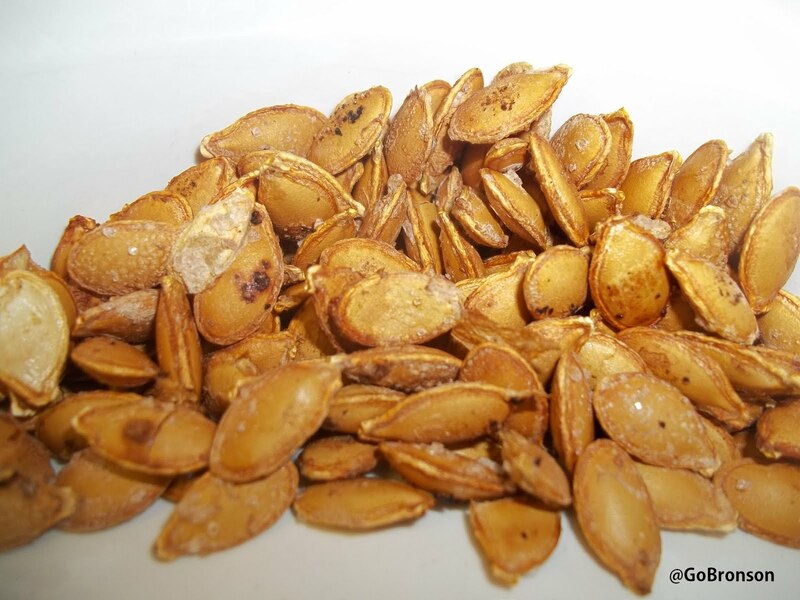 : Roasted or Baked Butternut Squash Seeds! YUM! This past week I was presented with a butternut squash and told to do pretty much whatever I wanted with it - turns out, vegetable chili tastes DELICIOUS when you throw in some squash! I know, I did! BUT! I am not here to talk about the chili for now, I actually wanted to share the awesomeness that is the SEEDS of said butternut squash! "SEEDS?!" you ask? YES! The butternut squash houses seeds similar to those found in a pumpkin but not in quite as vast a quantity. I wasn't really sure if you could roast them but after a quick look online I found nothing but positive feedback about the fabulous taste of a roasted squash seed and so off I went and roasted them up to see for myself! Now, to roast the seeds is pretty simple and can be flavored sweet or salty - I opted for salty this time around but I would love to try them with cinnamon! I simply rinsed the seeds, placed them on parchment paper, salted them and threw on a little cayenne pepper for kick and roasted them in the oven on 300 degrees for about 15 minutes until crisp and golden! Simple, quick and DELICIOUS! I only wished there had been MORE! Give them a try next time you pick up some squash! Oh those do sound good!! Seriously, I highly recommend them, even just once! Nom nom nom!